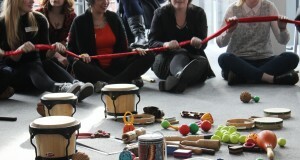 Over the past year Sound Connections has delivered three events celebrating musical inclusion; one focused on early years, one on working with young people in challenging circumstances, and one co-produced by Wired4Music with Sound Connections championing youth voice and participation. All three areas of practice still fight for their place in music education practice and policy and it remains important to shine a light on the best work happening in these fields. “With Open Arms: investigating musically inclusive practice in early years”, brought together over 50 early years practitioners, arts and cultural organisations and Music Education Hubs for a day of debate, case studies and conversation around equitable access and inclusivity. Kicked off by Dr Carolyn Blackburn, whose keynote addressed the current socio, cultural and political context, delegates also heard from organisation delivering extraordinary work with isolated families, children with Special Education Needs and Disabilities (SEND) and speech and language therapists. Clear themes from the day were around entrepreneurship, the benefits of multi-agency working and the importance and value of music and play for its own sake. We also explored bringing children’s voices to the foreground and the importance of reflective practice. You can read a write up about the conference here and a transcript of Dr Carolyn Blackburn’s keynote here. This year’s conference provocation was that “by 2020 we will no longer need to use the phrase ‘challenging circumstances’ in our work breaking down barriers to music opportunities for London’s children and young people, as the music education sector will have inclusion at its heart”. Delivered in partnership with Roundhouse, this year’s event was more youth-led than ever with members of Wired4Music planning, programming and facilitating the day. The event questioned how we can make diversity and inclusion a reality through presentations, panel discussions and workshops, led by Londoners aged 16-25 with the support of leading music organisations representing a range of projects and initiatives. The day-time event was followed by an open mic session and a gig produced by Springboard Live and members of Wired4Music in the evening. Our thanks to the National Foundation for Youth Music for funding and supporting all three events.